For other uses, see Tippet (disambiguation). A tippet is a scarf-like narrow piece of clothing, worn over the shoulders. It may also be likened to a stole in the secular rather than ecclesiastic sense of this word. Tippets evolved in the fourteenth century from long sleeves and typically had one end hanging down to the knees. In later fashion, a tippet is often any scarf-like wrap, usually made of fur, such as the sixteenth century zibellino or the fur-lined capelets worn in the mid-18th century. 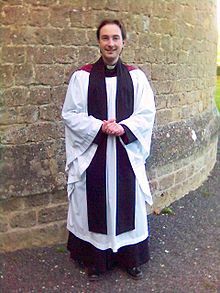 The ceremonial scarf worn by Anglican priests, deacons, and lay readers is formally called a tippet, although it is often known colloquially as a "preaching scarf". It is worn with choir dress and hangs straight down at the front. Ordained clergy (priests and deacons) wear a black tippet, while readers (known in some dioceses as licensed lay ministers) wear a blue one. Commissioned evangelists of the Church Army are presented with a cherry red 'collar' type tippet, as a sign of authority to preach, but some replace this with a scarf form of the tippet, but retaining the distinctive red colour. A red tippet is also worn in some Anglican dioceses by commissioned lay workers. Tippets are often worn for the Daily Offices of Morning Prayer and Evening Prayer, as required in Canon B8 of the Church of England (in the Canon, the word "scarf" is used in reference to the tippet). Stricter low church clergy may wear the tippet and choir dress during any church service, whether Communion is celebrated or not. This follows a practice that was enforced from the Reformation until the late 19th century. By contrast, Anglican Catholics tend not to wear the tippet, often preferring to wear the choir habit of Roman Catholic clergy instead. Clergy who are entitled to wear medals, orders, or awards may fix them to the upper left side of the tippet on suitable occasions (such as Remembrance Sunday). Sometimes the right end of the tippet is embroidered with the coat of arms of the ecclesiastical institution of which the cleric is a member, but some deplore this usage. It is common for English cathedral Canons to have the coat of arms of their cathedral embroidered on one or both sides of the tippet. The tippet is a different item from the stole, which although often worn like a scarf is a Eucharistic vestment, usually made of richer material, and varying according to the liturgical colour of the day. In the British Army, all serving chaplains are issued with a tippet to be worn directly over battledress when ministering in conflict zones. Anglican chaplains wear the standard black tippet, whilst Roman Catholic chaplains are distinguished by a violet coloured tippet. Some Lutherans also use the tippet. Members of the Lutheran Society of the Holy Trinity wear a black tippet embroidered with the Society's seal when presiding at the daily office. The black preaching scarf (or rarely blue, grey, or green) is also worn by some Scottish Presbyterian ministers and other non-conformist clergy. A different and non-religious sort of tippet, a shoulder-length cape, has been part of the uniform of British military nurses or of nursing uniforms in Commonwealth countries. These are often decorated with piping and may have badges or insignia indicating the wearer's rank. ^ "Canon B8: Of the vesture of ordained and authorized ministers during the time of divine service". Church of England. Retrieved 2 July 2018. 4. At Morning and Evening Prayer on Sundays the minister shall normally wear a surplice or alb with scarf or stole.